People with a large amount of Pitta are animated, occasionally hot tempered, have a sharp intellect and attach importance to aesthetics. 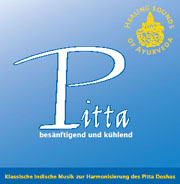 If a piece of music is to reduce increased Pitta then it has to go beyond just having a soothing, cooling effect and appeal to these strong qualities, otherwise it will not be listened to. The sitar is an excellent choice for such music because of its characteristic nasal, overtone rich sounds and great variation in the playing possibilities. The surbahar used in the alap is a kind of bass sitar. It is bigger than the sitar, the frets are wider apart and the strings are thicker, giving a deeper, more calming sound. The surbahar melody strings, like those of the sitar, run across the left hand side of the fret board, allowing them to be pulled as much as necessary across the free, right hand side during playing. This pulling of the string, varying from gentle to strong, allows the finest nuances of tones within an interval of up to three whole notes. Raga Ahiri can be heard on the surbahar in the alap, jod and jhala. In the compositions of the gat, Kushal plays Raga Charukeshi on the sitar. Raga Ahiri is traditionally played from late morning until shortly after midday. Kamal rishab (flattened Re) is flattened less than it is in the early morning ragas. Pa is used occasionally, with great thoughtfulness, to make the raga more interesting. Kushal Das plays alap and jod slower than normal, using less strokes, and with extended meends (glides). Some reverberation is added, which strengthens this effect, and is also cooling and soothing. The mood is meditative, but cheerful and light-hearted, and is enhanced by the careful use of the surmandal. Despite the slow, soothing tempo, this piece is full of rich variation which appeals to the intellect. It creates an inspiring bridge into the jhala, which is consciously kept short to achieve a calm transition to the gat. Raga Charukeshi originates from South India, but is played in North Indian style according to the time of day and coloured with various patterns. Here it is played for the Pitta time, covering the late morning and midday. To transport the meditative, profound, cooling and soothing feeling of alap into the gat, Abhijit Banerjee uses a larger tabla with more bass, which he plays in a manner suitable to the theme. The sitar and Raga Charukeshi are ideal for helping the listener to face his own emotions and feelings, at the same time appealing to the discriminating intellect. The gat contains two compositions in tin taal (16 beat rhythm) in vilambit laya (slow tempo) and drut laya (fast tempo). Tin taal is divided as follows: dha dhin dhin dha | dha dhin dhin dha | dha tin tin ta | ta dhin dhin dha (16 beats of 4 + 4 + 4 + 4). This recording of Ragas Ahiri and Charukeshi can be heard throughout the whole of the midday Pitta period from 10 a.m. to 2 p.m.
Kushal Das was born in Kolkata in 1959. He received his first sitar lessons from his father, Sri Sailen Das, and his uncle, Sri Santanu Das. He later deepened his studies with Prof. Sanjoy Banerjee and Pandit Ajoy Sinha Roy. To further increase his understanding of raga interpretation he took vocal lessons with Pandit Manas Chakraborty and Sri Ramkrishna Basu. Since 2002 Kushal Das has also played the surbahar. This version of Raga Ahiri is his first commercial recording with this instrument. As well as being a talented sitar player, Kushal Das has an extensive knowledge of ragas, which he has graciously used to support the whole Healing Sounds of Ayurveda project. Born in 1964, Abhijit Banerjee started studying tabla when he was four years old. He received his first lessons from Tushar Kanti Bose and later from Manik Pal. He became a student of the late Pandit Ghyan Prakash Ghosh, one of the most outstanding tabla teachers of the last century. In 1984 Pandit Nikhil Banerjee chose him to accompany his last European tour. Since then he has established himself in the large festivals in India and throughout the world. Next to his technical virtuosity, his sensitive playing makes him one of the most sought after tabla players of his generation.